Why Do People Buy Luxury Watch Brands? Years ago, I used to scoff at people who bought luxury watches. 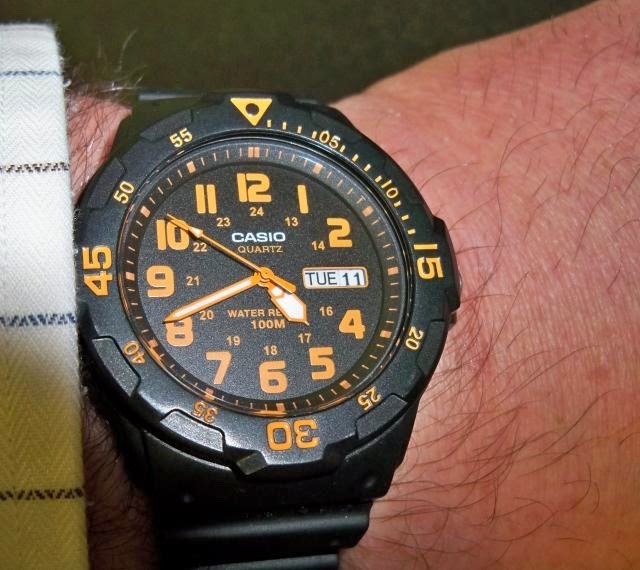 My brother-in-law would wear a Tag Heuer and make fun of my humble Timex or Casio. I'd ask him what time it was, he'd tell me, and I'd look at my watch and say, "Same here!" It was fun at the time. But, as I have gotten more and more into watch collecting, I can appreciate fine luxury watches. Especially when they are worn by someone who appreciates them not just as a display of wealth but for their art, materials, design, and history. For example, when you look at a Constantin Vacheron watch you see art and a heritage that goes back to 1755. Check out this triple complication pocket watch from Vacheron Constantin. It dates back to 1901 and it is a piece of art. So, while I can't afford a Rolex or an Audemars Piguet , I can appreciate them and I can dream. That's why I'll write about them from time to time. When it comes to watches, I have lots of slightly dressy watches for the office. They have interesting designs and they tend to catch the eye. They lend interest to my work day and sometimes get noticed by co-workers. But, when I come home, they come off and take positions on top of my dresser. I don't want to get them nicked up and battered. Sometimes, they've gotten uncomfortable over the course of a workday. When I get home I invariably reach for a bang around watch and--9 times out of 10--I reach for a Timex. 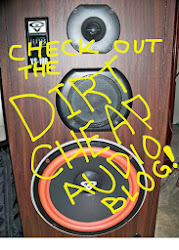 They are inexpensive, comfortable, rugged, and stylish. At least, I like the way that they look. 1. 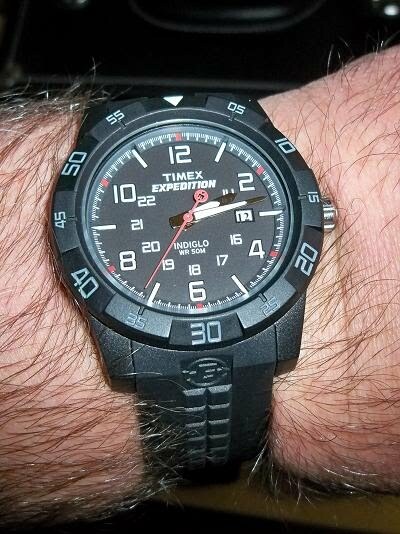 The Timex Expedition Core Resin. Do you love those exotic commando dive watches that can handle 300 meters of depth and excel on raids in low light conditions? Me too. Do you $1500 to blow on a watch? Me neither. Are you a commando? Me neither. But, the Timex Expedition Rugged Core Analog Field Watch / T49831 / lets me daydream. 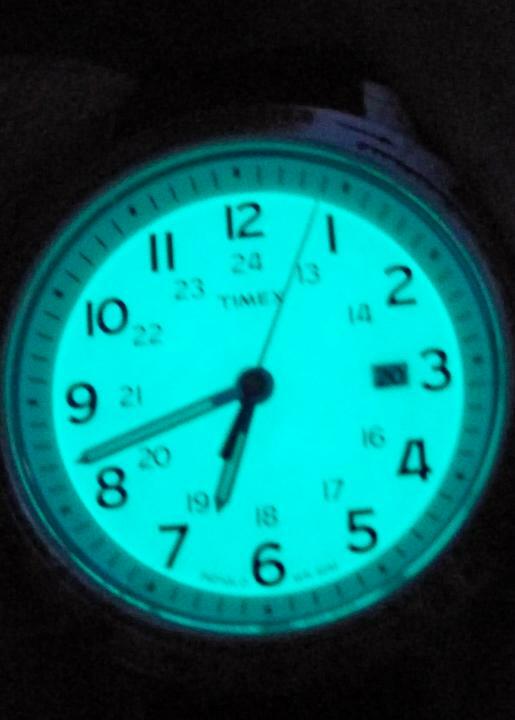 This watch isn't perfect. The bezel doesn't turn and it is only water resistant to 50 meters. But, this watch looks totally cool. It also has Indiglo lighting for those low-light adventures. 2. 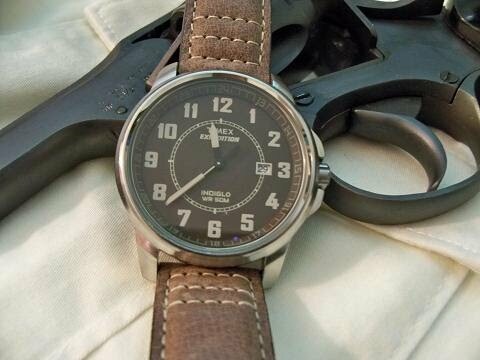 Timex Expedition Vintage Metal. Of course, sometimes I want to be a bit more low key. The Timex Men's T49891 Expedition Metal Field Brown Leather Strap Watch pays homage to the average G.I. It looks like it could have liberated Europe. But, it also looks great with my "Crocodile Hunter" shirt. 3. Timex Weekender. When it's time for a watch that is a little less intense, I like to wear my Timex Men's T2N637KW Weekender Sport Brown Leather Strap Watch . 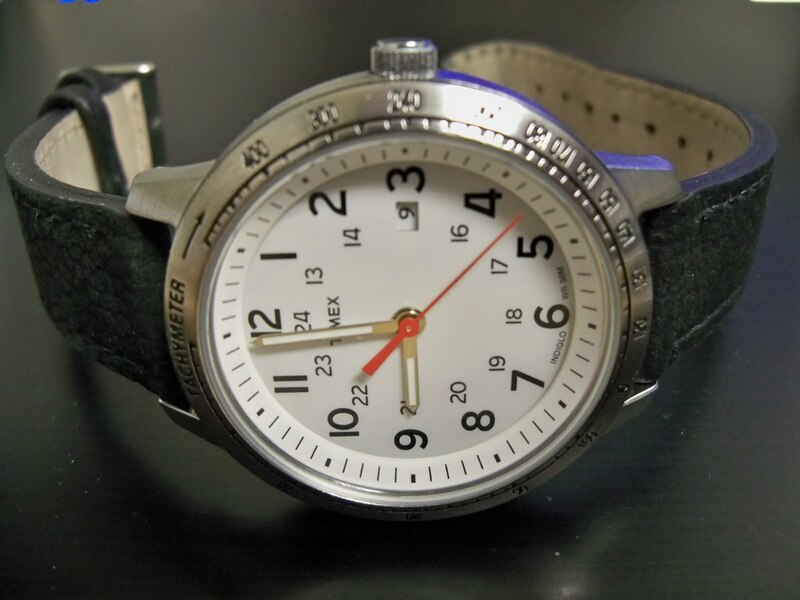 It's a great looking watch that is very comfortable and very easy to read. I think it would go very well with a house in the Hamptons or on Cape Cod. 4. Timex Elevated Classic. When it comes to the perfect balance of form, function, and readability, I really like the Timex Men's T2N695 Elevated Classics Dress Sport Collection Black Leather Strap Watch . The leather band is a tad wider than the one on the Weekender, too. One of my friends has a high end stereo. He is willing to delay gratification until he can afford the finest components. Then, he plans to keep those components for the rest of his life. He's a regular middle class guy. He isn't rich. He doesn't buy things often, but when he does, he buys the best that he can. It's an approach that some watch collectors take. Instead of having a hodge-podge of 90 watches, they have a collection of just a few high end timepieces. From time to time, I think it would be nice just to have a few high end Rolex watches . Sometimes, this approach of saving for a long time and buying carefully can allow middle class people to own some of the finest products. But, when it comes to high end watch brands, many brands have priced their products well beyond the buying capacity of middle class people. I thought that was the case for Rolex. But, I was recently surprised to discover a Rolex model that a middle class person might aspire to own. It's the Rolex Air King . At nearly $5000, the Air King isn't cheap. The Rolex Air King also isn't engineered to meet some artificial price point in the marketplace. While the Air King is the entry level Rolex, it's not an afterthought derived in a marketing department. This is a watch that is an integral part of Rolex history. According to an article by Joseph Lavender on the blog Jake's Rolex World called “The Complete History of the RolexAir-King,” the Air King was first made in 1945 to honor the bravery of RAF pilots and airmen. Thus, the timepiece is connected to the long heritage of the Rolex brand. Fortunately, the Casio Forester watch is quite inexpensive and after two and half years I can probably just get a new one. Plus, the crystal on mine has a minor scuff. This watch has been a good one for all sorts of little adventures from the swamps of Florida to walking our dog along a wooded path. I highly recommend it. I just wish I could change the battery smoothly.